A letter published by The Wall Street Journal on Saturday drew criticism from Jewish groups and readers for comparing recent protests targeting San Francisco’s wealthiest residents to a series of 1938 riots, instigated by German Nazis, that left dozens dead and kicked off the Holocaust. And as some began to question why the business paper of record give a platform to such a far-fetched analogy — in a letter that also unexpectedly glorifies serial novelist Danielle Steel as the city’s No. 1 celebrity — even if the writer was a legendary Silicon Valley venture capitalist. In an italicized tagline beneath the letter, WSJ introduced the author, Thomas Perkins, as founder of the VC firm Kleiner, Perkins, Caufield & Byers — which, despite bearing his name, distanced itself on Saturday from the “partner emeritus” profiled on its website. A quick Google search reveals more relevant biographical details. Perkins previously served as an independent member of the board at News Corporation, WSJ‘s corporate parent. And he was married to Steel for four years, during which she apparently helped him cut his teeth as a writer of a book you might find in an unlicensed plastic surgeon’s waiting room. Why didn’t the paper’s editors say so? 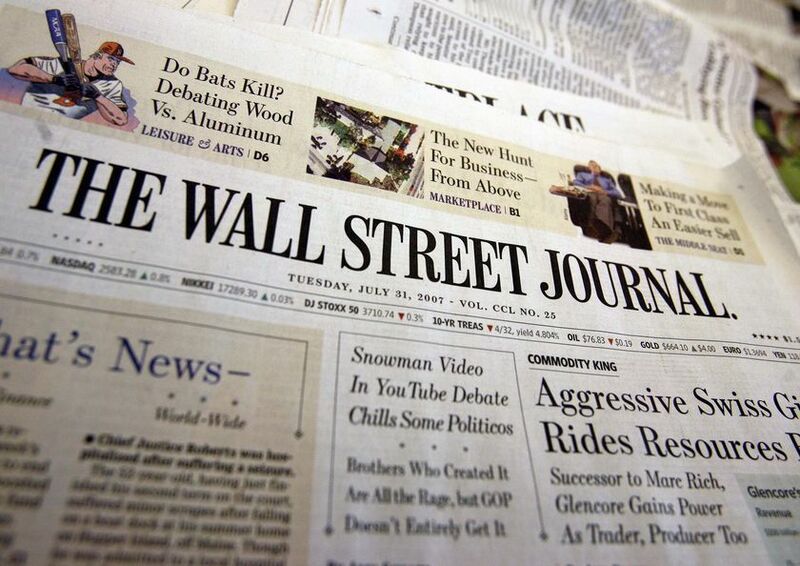 In recent years, the WSJ has repeatedly failed to disclose contributors’ biases and conflicts of interest, according to a 2012 study by Media Matters for America. The liberal media watchdog found that, during the 2012 presidential election, the paper published op-eds bashing President Obama’s policies written by advisers to Republican candidate Mitt Romney without noting their connections. According to a Media Matters review, the Journal published a total of 25 pieces from the following Romney advisers without disclosing their campaign ties: John Bolton; Max Boot; Lee A. Casey; Seth Cropsey; Paula Dobriansky; Mary Ann Glendon; Kevin Hassett; Glenn Hubbard; Michael Mukasey; Paul E. Peterson; David B. Rivkin Jr.; and Martin West. In several instances, the Journal failed to disclose an op-ed writer’s connection despite its own news section reporting that the writer is advising Romney. With respect to one writer, the Journal disclosed his ties to the campaign in an initial op-ed but failed to do so in subsequent op-eds. With regard to another, the paper failed to disclose the campaign ties in an initial op-ed but did do so in later pieces. The 10 remaining writers have not had their Romney connections disclosed in any of their op-eds following the publication of those ties, according to Media Matters‘ review. The Center for Media and Democracy called foul on the paper last August after it published a series of editorials defending the American Legislative Exchange Council, a nonprofit conservative advocacy group, without noting ties between the group and Stephen Moore, an editor on the board. Earlier this month, WSJ published an op-ed by former CNN anchor Campbell Brown that accused teacher unions of “making it more difficult to protect children from molesters.” But, as Media Matters noted in a blog post, the paper failed to disclose that Brown’s husband, Dan Senor, sits on the board of StudentFirstNY, a group that fights against teacher unions. In the last two years or so, many credible news sites have linked bylines to bios in which reporters can disclose their work histories, fun facts and, in some cases, possible conflicts of interest. But AllThingsD, the now-defunct News Corp. tech site fronted by Kara Swisher and Walt Mossberg, set the highest bar for disclosure, requiring staffers to detail (in paragraphs, if needed) any personal or financial stakes germane to the site’s editorial mission.